West Kendall is a Miami suburb within the census boundaries of Kendall. Often West Kendall and Kendall West are confused. 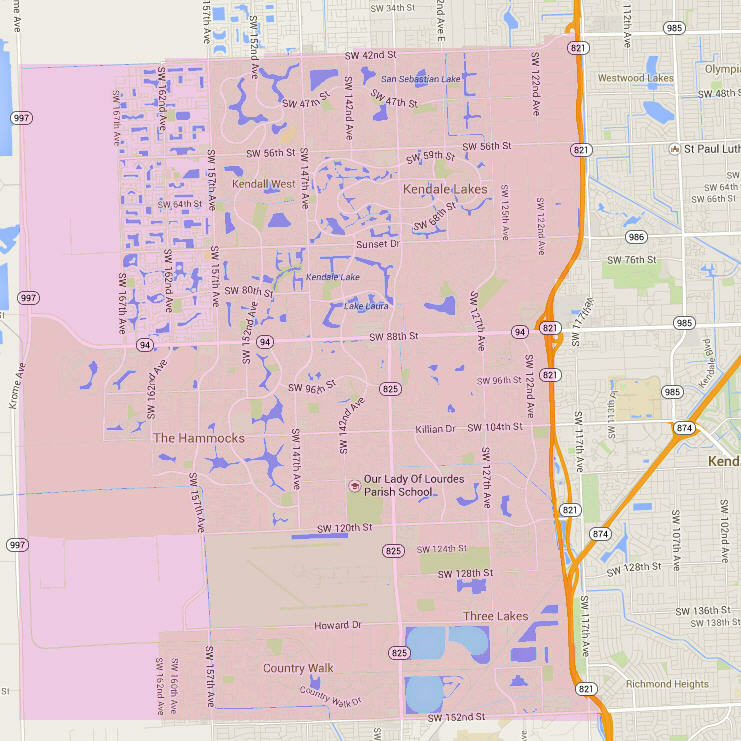 Kendall West is an unincorporated and census-designated area located between SW 147th Avenue and SW 157th Avenue. West Kendall boundaries begin from Krome Avenue (or SW 177th Avenue) east to the Florida Turnpike and between Bird Road to Coral Reef Drive (or SW 152nd Street). West Kendall includes the neighborhoods Lakes of the Meadows, Kendall Lakes, Winston Park, The Hammocks, The Crossings, Calusa, Devon Aire, Country Walk, Deerwood, Three Lakes, and Kendall Breeze. Some of the parks within West Kendall include Westwind Lakes Park and Kendall Green Park. Westwind Lakes Park is perfect for the skateboarder, with concrete paths, pipes and ramps, as well as a full service skate shop called Sugars Drop Shop. The park is home to the annual 3 day Skateboard Rodeo. Skateboards, inline skates, scooters, and bikes are permitted with mandatory helmet use for anyone under the age of 18. The park offers camps, lessons and birthday party options. Kendall Green Park is a scenic and green park with a large walking/jogging path for visitors. Other than the parks, there are multiple choices for shopping and dining. The Kendall Village Shopping Center is located off Kendall Drive, minutes away from Town and Country Mall, and includes a cinema and an open air shopping area, as well as a diner and a few other restaurants. This area is centered to all of Kendall’s amenities. Also within West Kendall is the Kendall-Tamiami Executive Airport, which serves corporate, recreational, flight training, and governmental agency activities. It is home to Miami’s Automated International Flight Service Station. Nova Southeastern University, a private coeducational research university, is also located in Kendall at the Kendall Village Center. Some of the public schools in the area are Oliver Hoover Elementary, Dante B. Fascell Elementary, Dr. Manuel C. Barreiro Elementary, Arvida Middle School, and Devon Aire K-8 Center. The private schools in the West Kendall area include Calusa Preparatory School, Archimedean Academy, Westwood Christian School, and Bridgepoint Preparatory. West Kendall is comprised of very diverse communities of single family homes, townhouses and condos for growing families with its own selection of restaurants, shops, businesses and parks. If you have any interest living in West Kendall, contact us and we will assist you with your real estate needs.